Each organization has their own vocabulary and yet, so does TheraNest. This article will walk you through the difference between a client, a case, and a note as well as what information is stored in them and who has access. Client: Anyone within TheraNest can add a client. A client record or client details does not hold any clinical information. The details section is administrative documentation such as demographic information, insurance, and billing. Again, any staff member or user of TheraNest can add a client and fill out or edit this information. Cases are a collection of notes and clinical information for a client. A case is like a file folder for a client's clinical documentation (Initial Assessment & Diagnostic Codes, Progress Notes, Treatment Plans, etc). A case provides a higher level of privacy for a client's clinical information separate from their details information. Sometimes the client can have multiple cases if they have individual appointments and are included in a group. They will have one case for their individual session notes and another case for their group session notes. Staff member's access is determined by their Permissions and whether they are assigned to a client. Remember: having access to a case is having access to a higher level of privacy. Staff members can be assigned to clients but to see clinical information they must also be assigned to the case. Let's talk about assigning a therapist to a client first. 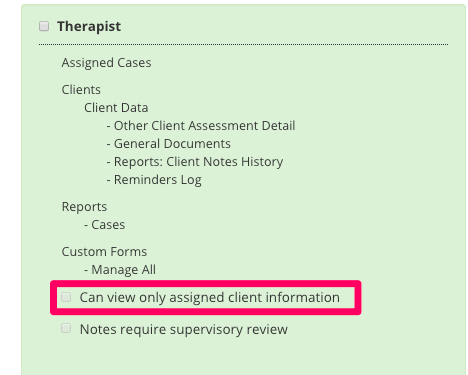 If a therapist has this box marked on their permissions this means they will only have access to the clients they are assigned to. Let's say there is a staff member named Jane and a client named John Doe. If the box, "Can view only assigned client information" is marked on Jane's permissions and she is not assigned to John Doe. Not only will she NOT have access to John's clinical information, Jane will also not see anything about John in TheraNest. She would search on his name and nothing would come up. If this box was unmarked, then she could search on John Doe and see that he was a client. Again, still not being assigned to the case means Jane does not have access to the clinical information. If a client already has a case that one is not assigned to then they will receive the following message: Tip! This client already has notes you aren't assigned to. Please contact administrator to get access. Please reach out to your administrator and ask to be added to the case or ask if you should create a new separate case. You will also see a similar message here on the cases page. Progress Notes are designed to capture session info as well as treatment updates for each session. The progress notes we are using are essentially an enhanced SOAP note format. So you can use our progress note template as SOAP notes. Please keep in mind there is no universal mental health note format, or more specifically, no format that is universally accepted by all insurers. We have attempted to create a note format which is acceptable to the majority of providers and to the insurers they work with. Also keep in mind that the Wiley Practice Planners, which we integrate with, require mapping certain kinds of data to specific fields, so these fields need to match the content of the data provided in the Wiley Planners. If you choose to use Custom Forms they cannot replace the Progress Notes within TheraNest. Admins and assigned therapists can view and add progress notes to the case.